I've been eyeing a Fit for months now. A few weeks ago I thought I had made up my mind to go with the fit (EX CVT). I found a price in Oct on trueprice.com that seemed more than reasonable but due to my work schedule I had to put off buying it. Well....its been over a month now and truecar has been consistently higher ($~500) for weeks now. I've contacted lots of dealers and they've all pretty much said they won't go down that far but would consider if I locked in the truecar price. But...while I can be a patient person the wait game is resulting in me rethinking my original choice of the Prius. So a Prius vs a Fit? To me the Fit has the Prius beat in almost every category. The only outstanding issues are legroom for the driver (I'm 6'6") and the mpg. As far as mpg is concerned I drive almost all highway today so in theory I should manage the epa estimated 41 or even better. If I could get 40 or more it would be close enough to the prius's ~50mpg that I wouldn't call it much of am loss. So that really leaves the legroom. My test drive, the more i think about it, I did left me thinking it wasn't bad but something felt odd about the placement of my left leg. To this day I don't know if it was the car or just me. Ever since that test drive I have questioned my current car's level of comfort for my left leg...before that I was always happy my the room in my car. I've contacted a couple of rental car places asking if they ever expect to have the fit...they don't. Anyone have any idea how I might rent a fit for a day or two to truly check my comfort level? I recommend going to a Honda dealer and asking if you could take a Fit out for an extended test drive. The dealer I was at today offered that to me and told me to come back when I was ready, whether is was 10 minutes or half an hour. That should give you a fair idea of how the Fit will feel. As an owner of a 09 Fit, I find the Honda "cheap" but yet fun to drive. The seats are thin, lots of road noise, but excellent gas mileage. I've test driven a Prius, and I found the driving experience very very different. More comfortable, more high-tech, good power, smoother...really just better all around. To me the Fit is a "kids" car, and the Prius is more refined. Study them carefully, because they are very different. I used to have to drive a '09 Prius for work and it was okay but it pretty much made me never to want to own one. I do like the look of the Prius C because it's a hatchback (big surprise, right?). I'm sure things have changed since then, but the Fit has built a reputation for me. I always hated that the Prius has a backup alarm INSIDE the car. I sure hope they did away with that. I have never driven a Prius but I second the recommendation to take the Fit on an extended test drive. I am 5'6" and my biggest complaint with the car is the seat and foot well. Something is just off about the positioning and the seat is just too close to the pedals. It is my only real complaint about the Fit...I just can't get comfortable with the footwell. Now height may have nothing to do with it as you may just be able to have the seat further back but I would think your height should be a factor here. Again, I have never driven a Prius but to me the Fit is a cool car. It's fun, unique and offers a lot for little money. The Prius just doesn't do it for me. Realisitically you will get at least 55mpg in the Prius as long as you are not mashing the gas. 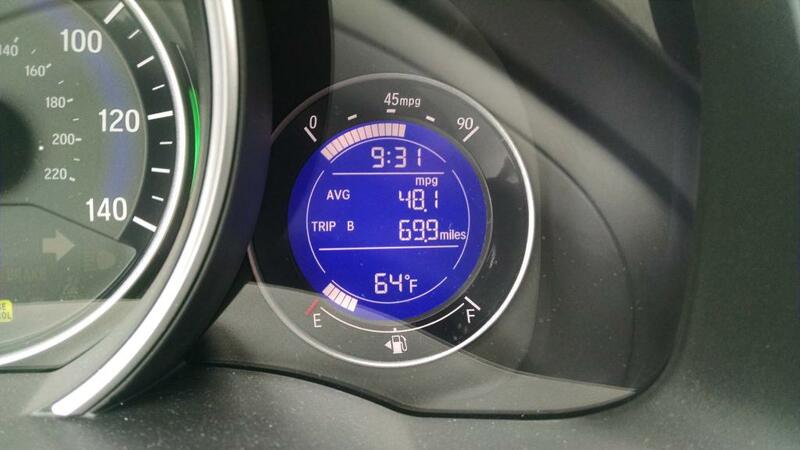 I was able to get 65mpg driving home one day by being ultra conservative, I mean that's just absurd. With the Fit you can get 40mpg on the highway as long as you are taking it easy. Lastly, there is a comomon misconception that the Prius is slow but that's just false. I found even with 4 people in the car I never struggled to get to highway speed. I tend to agree with Spacecoast. Depends on what you want and are willing to spend. 19,000 EX CVT Fit vs, on the low end, a 22,000 Prius. My Fit is a 2013 with AT and was closer to 16,000. I was looking for basic transportation at a low total cost of ownership, with a good shot at trouble free reliability. The recent dip in gas prices has probably softened the demand for the most fuel efficient cars. During the period before Christmas people are spending their money buying things that are not cars. For many dealerships they are trying to make a quota by the end of the month. So your timing might be good to get a low price on either one. Though the salesmen might be hungry and put up a fight for all they can get. You use a small enough amount of gas at 37.5 mpg that the additional saving of going to 50 mpg does not save you a large amount of money relative to the price of the cars. If you drive 15,000 miles a year and get 50 mpg in the Prius then you will use 300 gallons per year. At 37.5 mpg the Fit will use 400 gallons or 100 gallons more per year. At $5 per gallon you will spend and extra $500/year on fuel. Divide $500 into the difference in price and you get an idea of how many years till you break even. If gas is cheaper it will take even longer. And if the Fit gets better than 37.5 mpg, then will also take even longer to get back the extra money spent on buying the Prius to get better mileage. So for the $3,000 difference in price, 10 years at $3/gallon, 6 years at $5 per gallon and a year and a half at $20 per gallon. My wife has a Prius. In many ways it is a nicer car but it cost more to purchase. It is a bit spartan but I like my Fit. On the freeway the Fit can match the Prius's gas mileage with ease. I get ~48 mpg with th AC on. As a tech I have worked on both and they are equally as reliable. But, the simplicity of the Fit mean it will be easier and cheaper to repair every time. Drive them side by side. I'm a Toyota fan but that can make up for how boring the Prius is. I second what others have said about going for an extended test drive. When I was still researching the car, I heard from a few people that Honda doesn't sell their vehicles to rental car companies in the US. I was also told that keeps the resale price higher as the market isn't flooded with 3 year old Hondas... whether any of that is TRUE I don't know. I haven't bought either yet. For the moment I get blame work and the holidays for keeping me from car shopping further. The fact that truecar.com is now showing the price up another $500 is keeping me away too. I'm in no hurry to pay over the price I am looking for let alone over MSRP. Plus my Impreza is bound to be better in potentially bad winter weather than either the fit or Prius. That is an amazing average.